Samsung Galaxy Buds review | What Hi-Fi? Despite the convenience of ‘true wireless’ headphones (completely cable-free Bluetooth in-ears), it’s safe to say few models we’ve tested so far have fully lived up to the technology’s potential. Since true wireless models first hit the market, we have seen a few good efforts, such as the Sony WF-1000Xs and Samsung’s Gear IconX (2018 Edition), but most have been plagued by issues such as Bluetooth instability or unsatisfactory sound quality for the price. Samsung’s previous true wireless efforts were a decent success, so the all-new Galaxy Buds arrive with the company on the front foot. But do they allow Samsung to stay ahead of its true wireless rivals? As is customary for true wireless earbuds, the Galaxy Buds comprise two untethered earpieces inside a charging case that not only protects them when not in use, but also gives a few extra hours of juice on the go. The case is the shape and size of a pebble, and while we wouldn’t recommend throwing the Galaxy Buds in the sea just yet, it will easily fit into a coat pocket or small compartment of a bag. Due to true wireless earbuds having to house all the internals, most of the examples we’ve seen have been more cumbersome than we’d like, typically three or four times the size of regular wireless buds, but that’s not the case here. The earpieces, which sport a lovely pearlescent white finish (they’re also available in black and yellow), are pretty small, so no matter how shallow your lugs are they shouldn’t stick out. Their ergonomic shape – especially with the supplied rubber wingtips attached – helps them not only nestle in comfortably, but stay there too. Lifting them out of their case and into your ears automatically activates pairing mode, so your portable device should pick them up immediately. During testing, it works seamlessly with Samsung, OnePlus and Apple smartphones, but press-holding both buds for three seconds manually initiates pairing. The earbuds provide a playback time of six hours, with the charging case giving an additional seven hours. A small LED on the inside of the case changes colour to indicate the battery status. It can be charged via the supplied USB-C cable, although a powershare feature means the case can be wirelessly charged by placing it on the Galaxy S10+ smartphone’s back cover. The Galaxy Wearable app (Android only) is where you find out the battery status of the earbuds themselves. And that’s not all. For Android device users, the app opens doors to several other features, including touch control personalisation. Out of the box, one tap on either bud plays/pauses a song; two taps answers/ends calls or skips forward a track; and three taps skips back a track. In the app, you can ‘lock’ the touchpads if you find yourself accidentally brushing against them. You can also select whether a touch and hold action on either earbud launches Bixby voice control, turns the volume down or activates ‘Ambient sound’ mode. The latter amplifies background noise to enable you to hear announcements or stay aware of your surroundings without the need to remove the earphones. It serves its purpose, but is no way to listen to music for any length of time. The EQ modes – bass boost, soft, clear, treble boost and dynamic – are worth playing around with, although we tend to stick with dynamic. Lastly, the app allows you to set the Galaxy Buds up to alert you of any notifications, and even read them out. It can also help locate the earbuds if you forget where you last put them down. Bluetooth stability can make or break a pair of true wireless headphones. Even if a pair has excellent sound and design, regular dropouts and synchronicity issues can hamper the whole experience. During our first few days of testing the Galaxy Buds, the balance between the left and right buds would change regularly, and frequently drop out of signal. However, Samsung has since rolled out two software updates, which make a marked difference. They are now much more stable, although we do still experience the odd syncing issue when paired to our iPhone 6s Plus. What Samsung has failed to do, not for the first time, is engineer a sound worthy of the product’s asking price. The Galaxy Buds sound more or less equivalent to a pair of cheap in-ears - and not even a particularly good pair. Even taking into account the Samsung’s ‘true wireless’ practicality, the sound quality is very much at odds with the £139 price. We play Johnny Cash’s Hurt, and while there is decent clarity, the acoustic guitar lacks body and warmth. It sounds thin and hollow, and Cash’s vocal is tragically robbed of its compelling growl. The Galaxy Buds struggle with dynamics, and a lack of transparency means they don’t convey the innate interest of the tracks we’re playing. That thinness also highlights the distortion at high volumes during dense instrumentals. At this point, we start considering that if our reviewing process was equivalent to speed dating, we’d now be counting down the minutes until the next pair came along. We’re surprised that the Galaxy Buds have been produced in collaboration with Samsung-owned brand AKG, whose own headphones we have often praised. It doesn’t help that the Award-winning Sony WF-1000Xs (£145) are considerably better all round, demonstrating superior dynamics, detail, balance and rhythmic aptitude. The Galaxy Buds’ sonic quality is much closer to that of the three-star Apple AirPods, but we prefer the AirPods for their greater refinement and balance – and that’s saying something. That’s a shame, because not only were they launched with Samsung’s Galaxy S10 and S10+ flagship smartphones, but also because Samsung’s previous true wireless headphones, the Gear IconX (2018 Edition), were pretty decent. It’s also a pity that sound performance lets down what is otherwise an exceptionally-designed and well-featured pair of true wireless headphones. 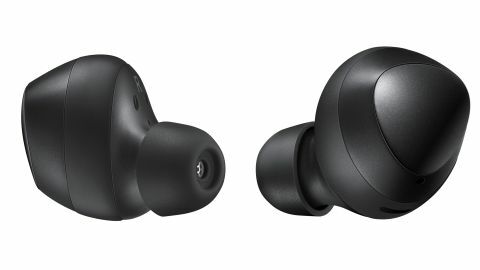 Compared to the Gear IconX, the design has been enhanced and the price slightly lowered, but the poor sound quality means Samsung has taken one step forward and two steps back. Steer clear.